The new year will command the beginning several leaks surrounding the Xiaomi Mi 9, an upcoming flagship belonging to a lineup that always gets released during the first half of the new year. 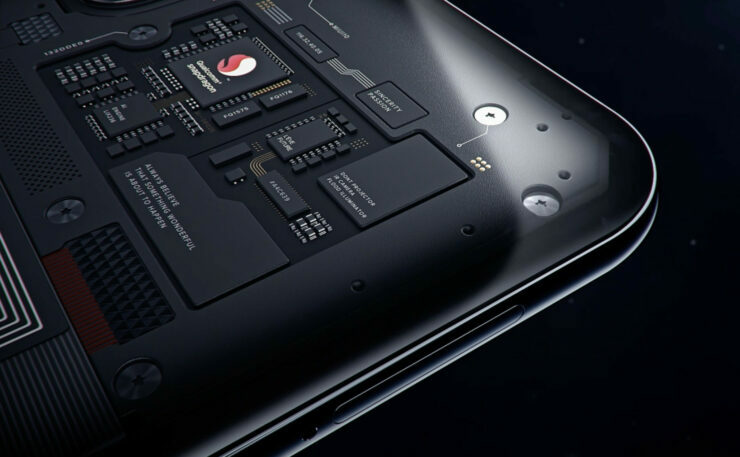 Comparing it against the 2018 Mi 8, the Mi 9 is expected to showcase significant improvements in the hardware, optics and fast-charging departments. One leaskter on Weibo has shared a list of the upcoming flagship’s hardware and the details look very impressive on paper. 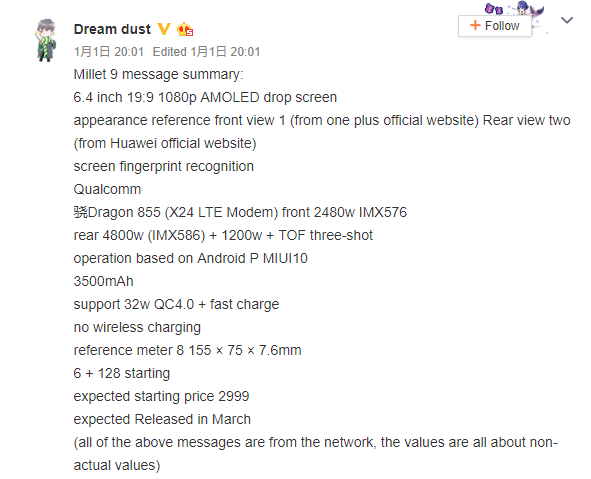 A tipster by the name of ‘Dream dust’ has shared a long list of the Mi 9’s alleged specifications. The display is believed to be a 6.4-inch AMOLED screen with a 1080p resolution, 19:9 aspect ratio and a teardrop notch to maximize screen real estate. This means that the Mi 9 might not sport a punch-in hole camera and thankfully, for biometric authentication, there is expected to be an in-screen fingerprint scanner. Since Xiaomi will price the Mi 9 competitively, we can expect an optical in-screen fingerprint reader instead of the higher-end ultrasonic variant. Related Xiaomi Was Supposed to Penetrate the U.S. Market This Year; Has the Company Delayed Its Plans? The Mi 9 will be armed with a Snapdragon 855, but the details state that it will not be 5G compatible. Instead, it will feature an incredibly fast Snapdragon X24 LTE modem. 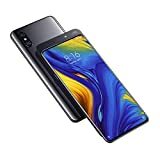 Perhaps Xiaomi will not give the Mi 9 5G because the company is expected to launch the Mi MIX 3 later this year and it will be armed with a Snapdragon 855 paired with Qualcomm’s Snapdragon X50 5G modem. Coming to the rear camera configuration, the upcoming flagship will reportedly have a triple-optics solution, with the main one being the Sony Exmor IMX586 48MP camera, coupled with a 12MP secondary camera. The second sensor should be used for capturing images with lossless zoom. The last one will be a ToF sensor and it will most likely be used for AR purposes. The handset is expected to come with a 3,500mAh battery, along with running Android 9 Pie and MIUI 10 out of the box. Future customers will be able to charge the flagship fully in almost no time as the smartphone is expected to support 32-watt fast-charging, but the bad news is it will not have Qi wireless charging. 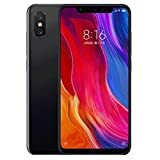 The base model is expected to come with 6GB RAM and 128GB of internal memory, with the leakster stating the price tag to be around CNY 2,999, or less than $500. The launch of the Xiaomi Mi 9 is expected to take place during March. As with any alleged specifications leak, take this information with a pinch of salt for now and we’ll be back with more updates just for you. As a first impression regarding the hardware specifications, how do you think the Mi 9 will fare against the upcoming competition? Tell us down in the comments.